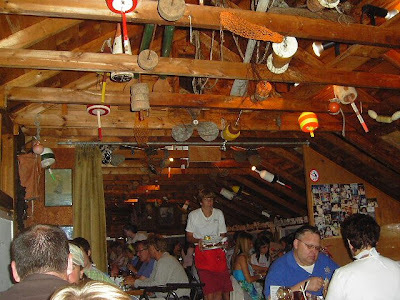 Any weekend in Kennebunkport would not be complete without a visit (or two) to Nunan's Lobster Hut. I have eaten lobster all over New England and the world and I just haven't found a better place for lobster. Their motto is "we catch em, we cook em, we crack em, you eat em." Nunan's is located on route 9 in Cape Porpoise-about 4 miles from downtown Kennebunkport. It's a SHACK-literally- with very spare wood tables and benches. 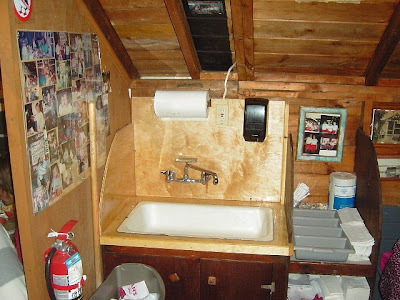 They even have a couple of washing stations to clean up all the lobster mess when you're done eating. They've been at it since 1953 and they have kept it simple; why mess with success? 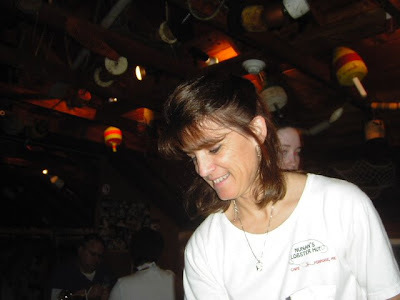 Here's a shot of the interior with one of our favorite servers toting trays of lobster carcasses back to the kitchen. (I promised her she'd be on the internet). Our server for this evening's feast thought we were a bit crazy, but she joined in the fun too. 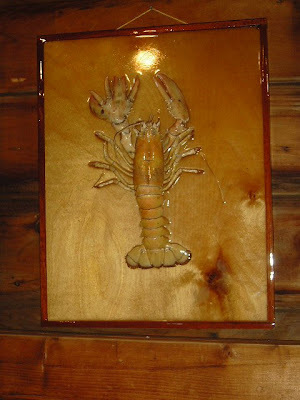 While waiting to eat, you can look at the many lobster related items hanging on the walls. One of my favorites is the multi-clawed, mutant lobster. 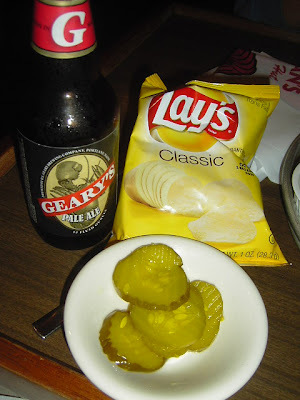 All meals at Nunan's are served with potato chips and pickles. Don't ask me why, that's just what they do. We always ask for extra pickles. I like to add a Geary's Ale to the mix as well. 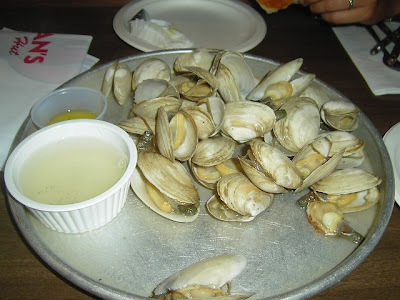 We always start out with a big pile of steamed clams. 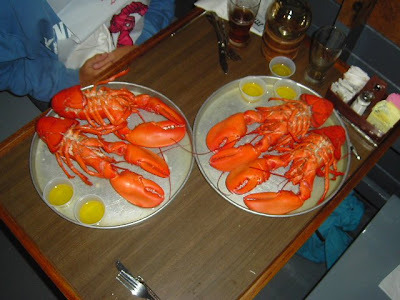 Followed by a couple of orders of twin lobsters. When we eat lobster, WE EAT LOBSTER! Every bit of meat is picked from the body. Nothing but shells left here! 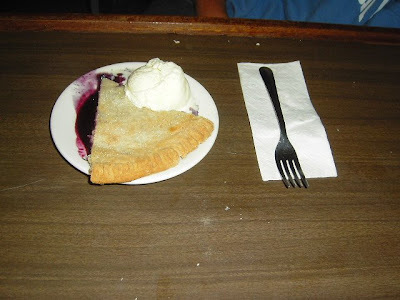 A nice piece of homemade blueberry pie a la mode (to share) rounds out the evening meal. 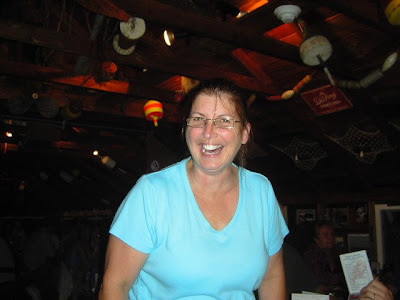 We ate at Nunan's on the second night of our first trip to Kennebunkport 9 years ago. We have not had dinner anywhere else since. Why mess with a good thing? I asked matriarch Teri Nunan why they don't have a website. People are constantly taking pictures in the place. There are pictures of folks with their lobsters all over the walls. I'll bet if they put up a site, they'd have folks emailing pictures for posting every day. Teri, who claims she never smiles, has the domain reserved. The Nunan clan is just too busy cranking out the lobsters to get a site together. Hey Teri, if you need some help, I don't work winters! 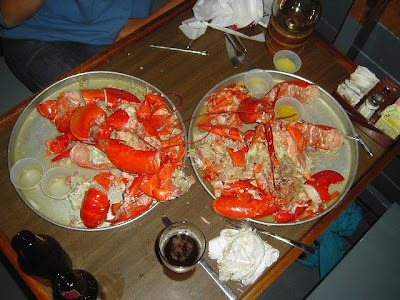 All kidding aside, Nunan's has the best lobster on the planet. PERIOD.